Adults take 1 tablet per day or as recommended by your healthcare professional. 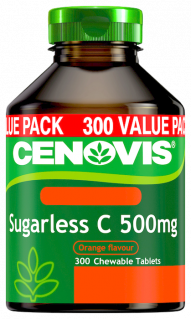 Cenovis Cold Sore Complex provides relief from the symptoms symptoms of facial cold sores, while helping to reduce the occurrence of facial cold sores in a convenient, once daily dose. Contains both Vitamin C and Zinc to support healthy immune system function. If you are prone to facial cold sores, Cenovis Cold Sore Complex is a convenient way to take on a daily basis to help reduce the occurrence of facial cold sores.